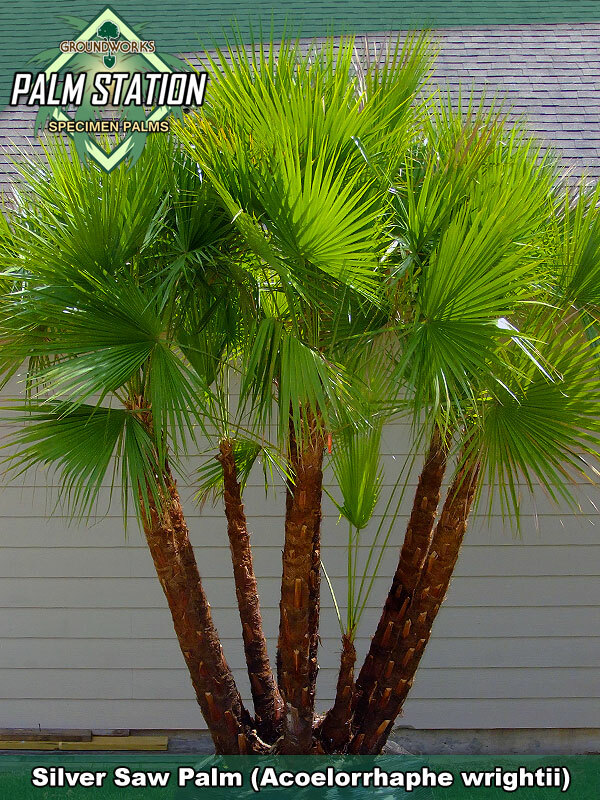 This attractive clumping palm is also known as a Paurotis palm and it makes a beautiful and interesting landscape specimen. Though a native of southern Florida, the Paurotis is cold tolerant into the low 20's and is well suited for use on the gulf coast and in Southern Texas. The palmate leaves are light green with silvery undersides and grow to about 2-3 ft in diameter. Rows of sharp orange teeth are spread along the edges of the frond stems and inspire its common names, The Silver Saw palm. About 25 leaves are arranged into crowns that sit above thin stems that are only 3-4 inches in diameter and are covered with loose brown fiber. These slender stems can eventually grow to 30 ft high but this species is very slow growing and the Silver saw will spend decades reaching that height. These specimens, when kept trimmed up from the base, demonstrate their beautiful multi stemmed nature display reddish brown trunks of various heights in a single clump. Silver Saw's bloom in the late spring with white flowers arranged on 3-4 ft inflorescences that extend past the leaves. The small fruits become orange at maturity and add unique texture and diversity to the landscape. 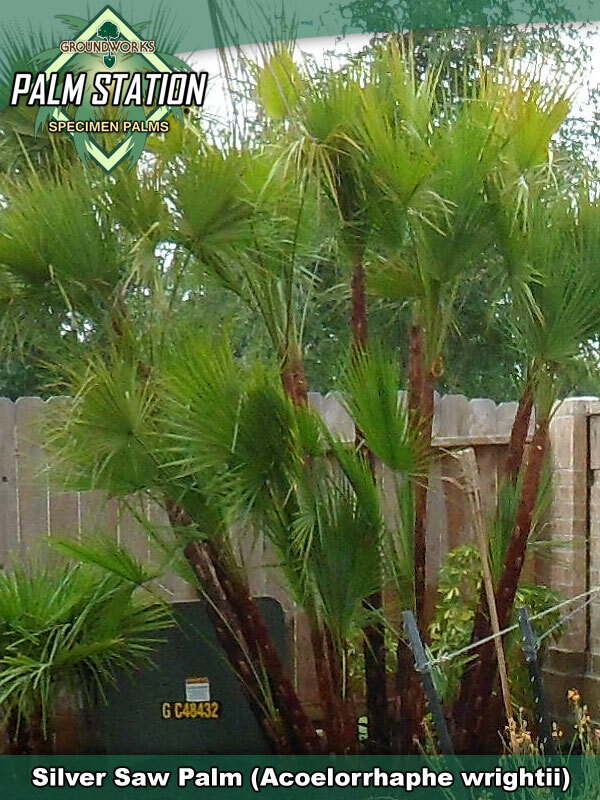 This is one of the few palms that is tolerant of standing water and drought conditions. Prefers full sunlight but will tolerate some shade. Likes moisture and does very well under constantly wet ground conditions but will also thrive under drought conditions assuming a reasonable amount of irrigation is available. USDA Zones 9 - 11. Is tolerant of frosts down to the mid 20's. Silver Saw's will demonstrate frond burn during mid 20's freezing conditions but tend to usually recover very well in just a single season. 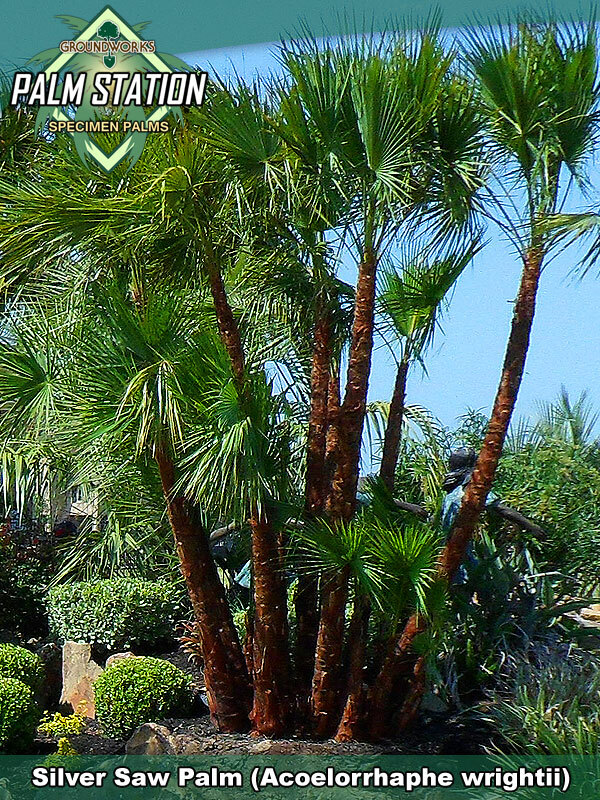 Groundworks Texas and Groundworks Palm Station - Houston have excellent availability of Silver Saw Palms up to 14' overall height with no less than 7 stems. Larger available on request.